So, I was looking for a comforting treat for a cold Sunday afternoon and, I thought of BROWNIES !! This was, therefore, a new challenge in my new diet… Making those bownies without gluten, dairy or egg white (as they are the most allergen in the egg). After my success of the Provençal savoury cake with tapioca, I decided to use this new discovery for my brownies too. Comforting and very yummy, these brownies were quite a success although I will say that they should be enjoyed with a little moderation as they are rather rich ! Réconfortants et très gourmands, ces brownies sont à consommer avec grand plaisir mais tout de même un petit peu de modération car ils sont plutôt riches! Put 2 tbsp of tapioca to soak in a bowl with 6 tbsp of water for about 15 minutes, or until it has absorbed all the water. Break the chocolate into bits, add the margarine and put in a pan to melt while mixing. Add the 3 yolks (well separated from the whites) to the chocolate mixture. In another bowl mix the rice flour, the nut powder, nuts, almonds, raisins and/or cranberries. Add the chocolate mixture, mix well and then mix the tapioca in. Let them cool down before you cut them, they will be easier to cut out. Mettre 2 cuillères à soupe de tapioca à tremper dans un bol avec 6 cuillères à soupe d’eau. Casser le chocolat en morceau, ajouter la margarine et mettre à fondre à feu doux en ne cessant jamais de mélanger. Ajouter les 3 jaunes d’oeufs. Dans un saladier, mélanger la farine de riz, la poudre de noisettes, les noix, amandes et raisins puis le chocolat et la margarine. Ajouter le tapioca. Mettre dans un moule rectangulaire avec du papier cuisson et mettre à cuire pendant 30 minutes environ à 180 °C. Laisser refroidir avant de les couper. 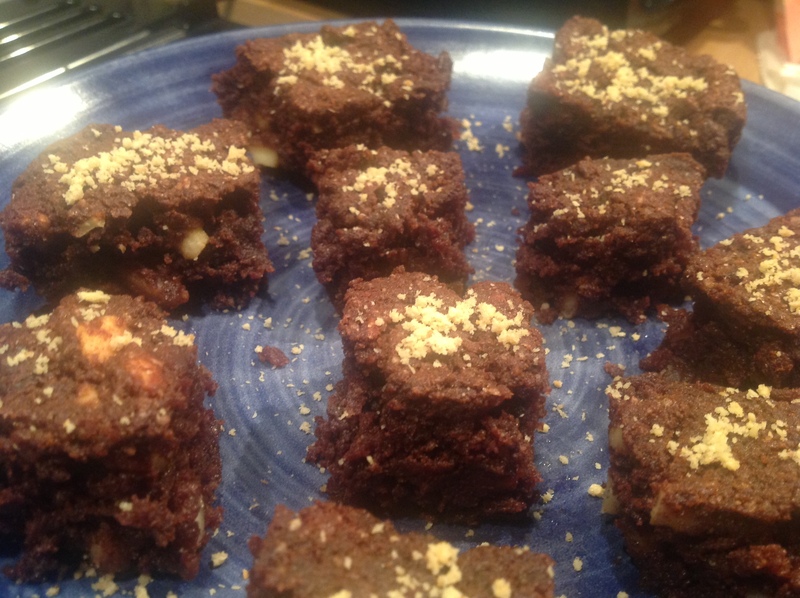 Let me know what you think of these brownies… Challenged achieved ? They were quite rich indeed! I did! And how neat that they are also gluten-free. I ADORE brownies….